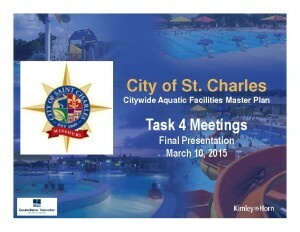 In March of 2014, the Parks and Recreation Board contracted with Kimley-Horn and Counsilman-Hunsaker to complete an Aquatics Comprehensive Plan for the future of St. Charles Aquatics. Blanchette and McNair Facilities were built in 1992 and Wapelhorst Facility in 1996 and nearing the end of their productive life without major renovations. The Consultants scope of work includes existing facility audits, demographic research(population, age, income, competitors), community focus groups and public forums, detailed cost estimates(capital, operational, revenue, business plan) and an implementation plan(facility types, location and phasing). The final presentation was presented to the City Council, Mayor and Parks and Recreation Board on March 10, 2015. The presentation is below in a PDF format. The next meeting is scheduled on July 14, 2015 in City Hall Council Chambers. To gather more input from our community, we are seeking additional suggestions and comments. Please feel free to call 636-949-3372 or email maralee.britton@stcharlesparks.com. This is a larger file at 10MB and may take a moment to download.